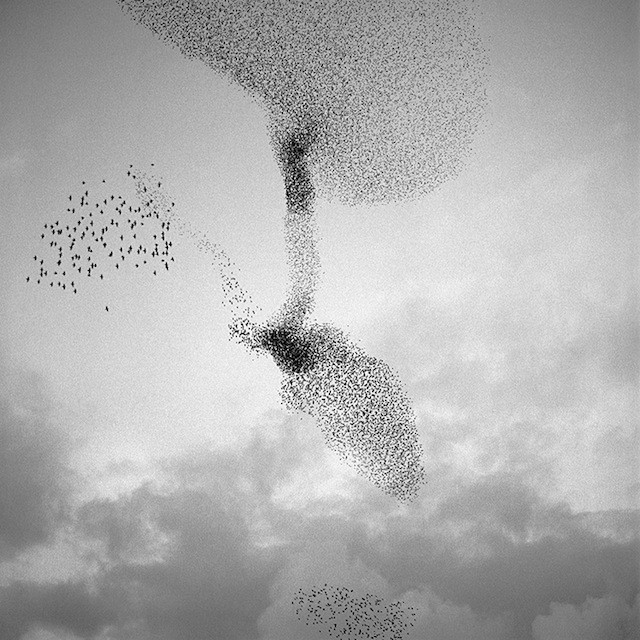 Anyone who’s witnessed a massive flock of starlings soar through the sky has likely been struck by the surprising geometric shapes formed by the crush of wings. Even the name for a throng of these birds sounds like poetry: a murmuration. 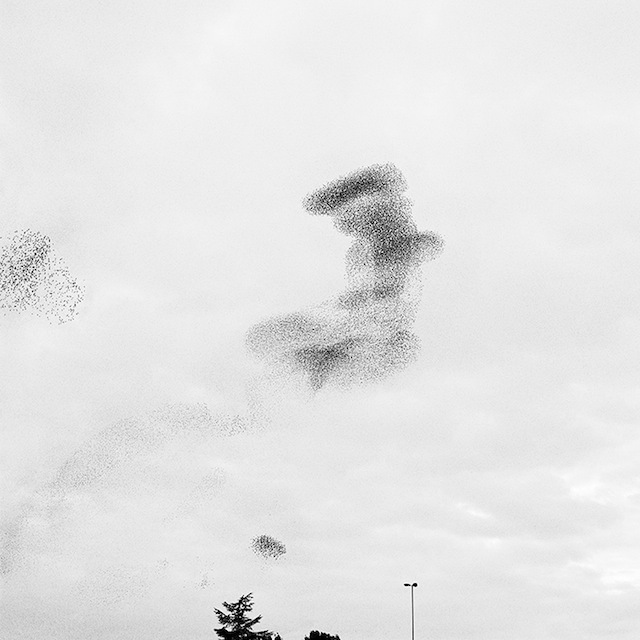 New York–based photographer Richard Barnes spent time observing some of the largest starling flocks in the world over a Rome suburb, and the images are currently on display at Foley Gallery on the Lower East Side. 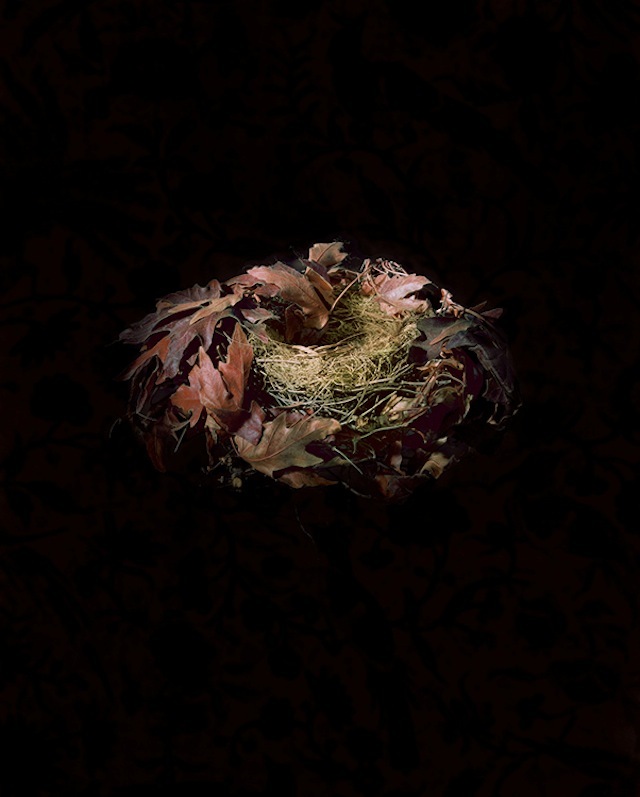 The exhibition, Murmur & Refuge, is named after two of Barnes’s series: Murmur, which are the starling photographs, and Refuge, whose pictures capture the architecture of bird nests, including the trash that gets embedded as nature and development overlap. They’re very separate projects in many ways, despite their shared avian subjects. 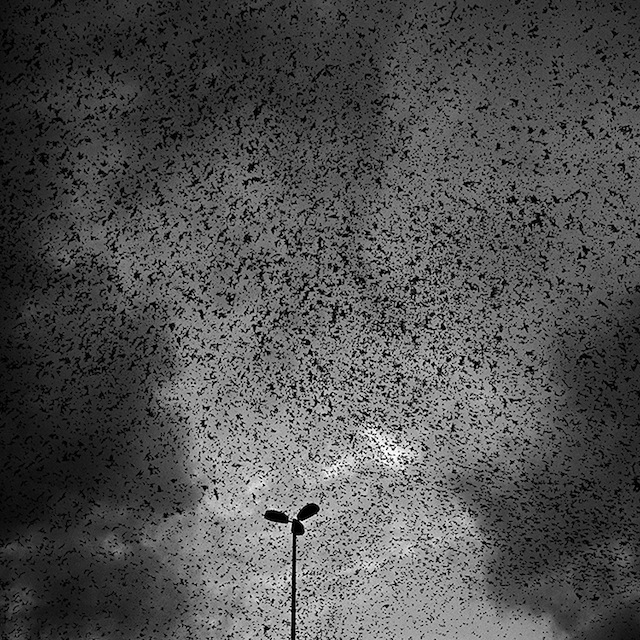 When you look at the Murmur prints up close, the individuals in the thousands of birds are like dabs of ink, their edges almost pixelated into abstraction in the gray sky. 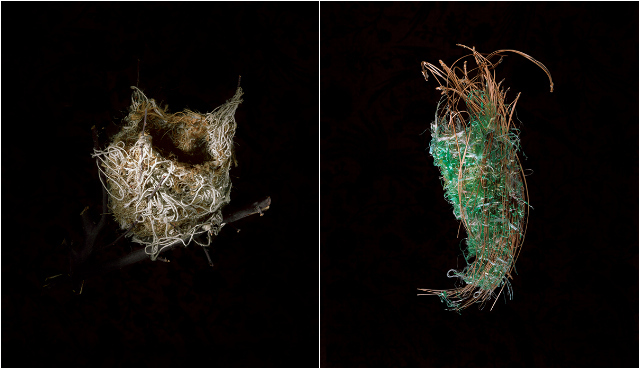 The photographs in Refuge, on the other hand, are incredibly sharp, each nest posed against a black backdrop; the individual twigs and human detritus like twine, lint, and plastic pop with structural detail. Both series, however, involve a fascination with nature and how we examine it, whether that’s down on the ground while gazing at the sky or collecting pieces of it as specimens for study. Another series by Barnes that’s not in the exhibition, Animal Logic, features behind-the-scenes photographs from natural history museums. In those, nature is something captured and controlled, or at least a facsimile of it, in taxidermy and dioramas. The Murmur photographs seem to respond: even if we take down the birds and preserve them for close examination, there’s still an awe in their wild mystery. The way murmurations work has only recently been explored in scientific detail, with the technology to capture such quick motion and analyze it finally available. As Wired reported in 2012, it turns out that the formation of the flock works a bit like magnetized metals. The birds respond to the movements of their fellow birds, even if they’re all the way across the flock. There are still many gaps in our knowledge of how the murmurations form and stay together, but the logic of what looks like barely coordinated chaos may slowly be revealed. None of that is explained directly in the exhibition. 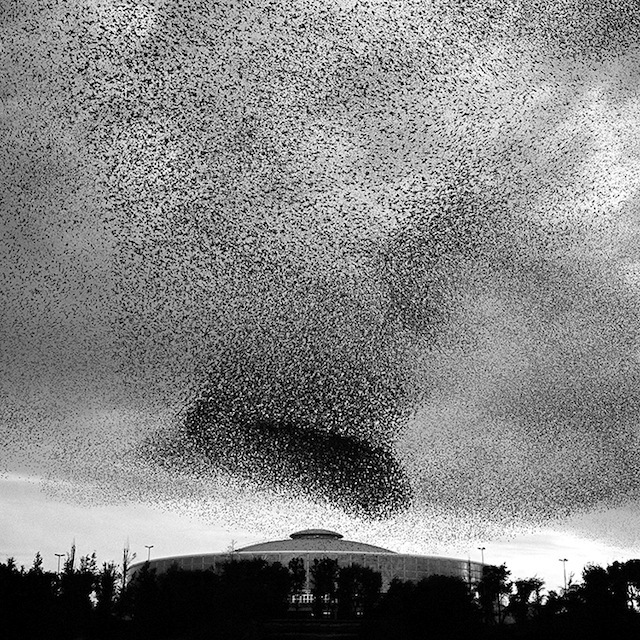 You’re just faced with these starlings that flock like developing storms. The nest photographs are beautiful, too, particularly looking at the shadowed spaces in their interiors as places of safety from the world, even when the waste of humans has been built inadvertently into their architecture. But it’s the starlings that really stick in your mind. They’re both foreboding in a Hitchcockian way and captivating. Barnes isn’t the first artist to venture beneath their shadows — Paolo Patrizi has a series on them as well, and Catherine Ulisky has even taken to plotting their geometry on the sky — but their depiction here really demonstrates their movement as a natural means of survival, as well as evoking the mystery in their choreography. 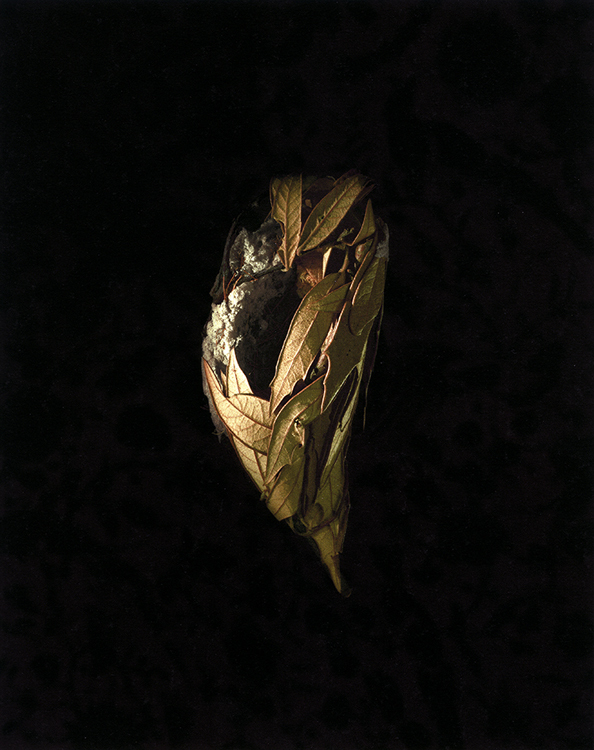 Richard Barnes: Murmur & Refuge continues at Foley Gallery (97 Allen Street, Lower East Side) through February 23.